In 2015 the Hooper Eblen Center underwent major renovations! The "Hoop" as many fans call it holds 9,280 fans. The center has two levels. The lower bowl has chair-back seats that are cushioned. The top level has bleacher seating with chair-backs built in for each seat on the bleacher. The Eblen Center has a center hanging scoreboard as well as four other scoreboards. 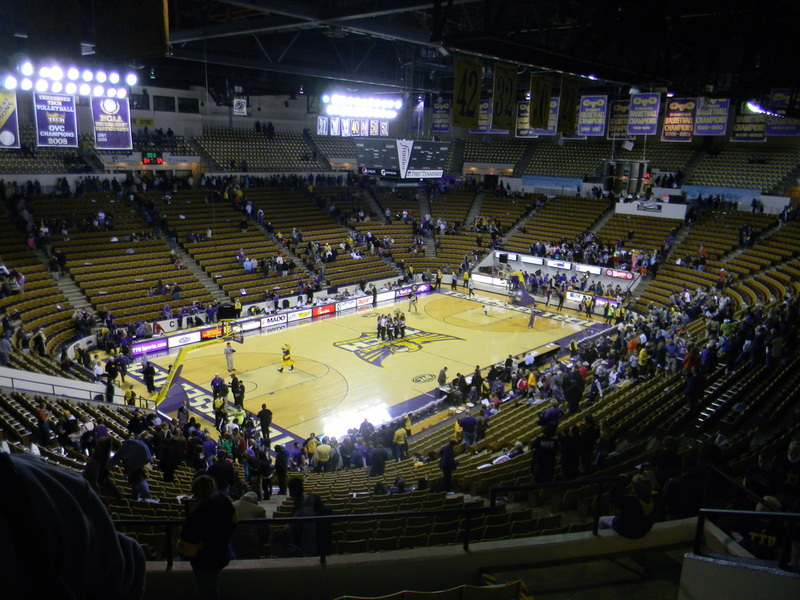 The court has the TTU logo at center court. Inside the three point line they have two different tones of wood. The baselines are purple with Tennessee Tech on both of them. The Basketball Complex is located in the Eblen Center. It is located in the upper bowl. In the complex they have one skybox that sits in the center. The concourse is dated, but it serves it's function. In the overview below I will state what needs to be done to take the Eblen Center to the next level. #1 Parking is right outside of the Eblen Center and free of charge! #2 Stop and get something to eat! I suggest going to Spankies right across from campus. Some other restaurants given to me by fans were Crawdaddy's, BoobyQ's, and Mauricio's. #3 Next take a look around campus. Find Memorial Gym, really cool old gym. Then head out of the gym and go by the library and student center. From there you will see the football stadium which is near the Hooper Eblen Center. #4 Go to the Ebeln Center! 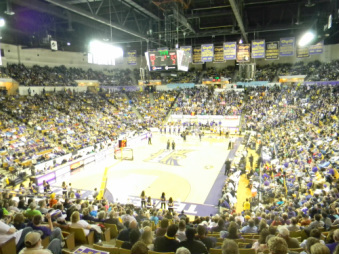 Arena- Overall I like the Eblen Center a lot, but there are a few things I would change to take it to another level. The lower level seats are cushioned and chair-backs, but they look dated. I would change the color of the chair-backs to black or purple and add some yellow seats that spell out TTU. I would also like to see better scoreboards and possibly a video board. The current scoreboards give us the basics. I would like to see the scoreboard from the ceiling include player number, points, and fouls. A video board would be nice for replays and are always nice for the fans. The floor seems a little dark and doesn't stand out. Redo the floor and give the purple and yellow more of a presence on the floor. Overall the arena has the structure to be a great arena. Adding in some of these upgrades would be great for the team, fans, and recruits. Scoreboard- The current scoreboards are very basic. Drop down scoreboards are always nice, but it only shows the score, team fouls, and time. The other scoreboards provide the same information. This makes it hard for fans to know who's in foul trouble or how many points a player has. You don't want fans looking at their phones for player statistics. Adding the players points to a scoreboard would change this. Atmosphere- The atmosphere was great, the crowd brought plenty of energy from the tip. The student section was pretty big and they were loud throughout the game. Overall one of the best crowds I've reviewed. Campus-Most of the buildings on campus have a similar appearance. There are too many parking lots throughout the campus and not enough green space in the central parts of the campus. My favorite part of the campus is the Memorial Gym area. What's Your Rating for the Eblen Center?